As low as $15.24 after coupon and 15% S&S, so just $2.54 a bag! 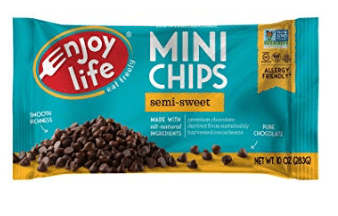 This is an amazing price for Enjoy Life chocolate chips. These chocolate chips sell for up to $5 a bag in store! I bake with these chocolate chips and they are so good! You can even melt them with a little coconut oil and make candies or make chocolate covered strawberries with. Enjoy Life chocolate chips are perfect to have handy for holiday baking. They are free of dairy, gluten, soy and other top allergens. They are also Paleo and vegan friendly. Get 40% off Enjoy Life Holiday Chocolate Candies!